This time next month the arrival of new toys will be imminent. The onslaught, from generous and thoughtful relatives and friends, could possibly start before the 25th, and by St. Stephen's day our home will be bursting at the gills. Just to clarify, I'm a borderline minimalist when it comes to my home. I adore clean space, a place for everything and everything in its place. I try to live with only necessary items and as a result we have very little clutter. But toys can be a little tricky. It's not really up to me to pare down the boys toys, that's their job. Yet from experience I know how hard it can be to get a young child to choose toys to give away (even the ones they don't play with), and unfortunately when not kept in check toy clutter can quickly take over an entire home. Can you tell I get a bit anxious at this time of year?! Over the years, out of necessity, I've found some good ways of keeping toys at bay. And the best place to start is to simplify. I do the first part on my own. I definitely know the toys that they never ever play with, toys that may be broken or that they've outgrown. All of these go in the bag. After that, we go through their toys together. My kids tend not to like the words "toys" and "give away" in the same sentence, to get around that I ask them which toys they would like to keep. From the pile of toys we're left with, I ask which toys they want to donate and which they want to set aside. The toys that are set aside are put in a bag, if they haven't asked for them over a certain agreed period of time then it's time for them to vacate the building. On a rare occasion when they want to donate something that holds sentimental value for me (like their first teddy or a toy that was a favourite of their older brothers) I'll pop it in a memory box instead. After the decluttering, it's time to organise, but thankfully that's another days work! It makes sense to think that having a room filled with toys is good for our little ones. We want to give our children the best and surely a good way to show them our love is through their toy collection. However, it's been proven that limiting the amount of toys a child has is far more beneficial to their well being. Having endless toys strewn around their room actually makes a play space over-stimulating for children and lessens their enjoyment of play. When too many toys are introduced into a child's life, their attention span begins to suffer. I often find my boys won't fully appreciate a toy in front of them when there are countless more to choose from. Whittling down toys to the ones they love playing with gives them increased pleasure from the toys they actually own, and as a result longer stints of playtime. I really don't want to sound like the grinch here but having less toys really is better! Too many toys can prevent a child fully developing their imagination. With less toys and an organised system there will be a dramatic change in your child's ability to tidy up their toys after play. Children with less toys value the ones they have and take better care of them. Fewer toys allows for a greater appreciation of art, books and music. Outdoor physical play results in happier healthier bodies. Fewer toys encourages children to become more resourceful by problem solving with materials at hand. Things I've heard over the years that I try to remember. Don't put lids on toy containers and toy buckets. When children can see their toys it encourages them to play. Quality is better than quantity. Wooden toys are a good example, they might be a bit more expensive but they're definitely worth it. 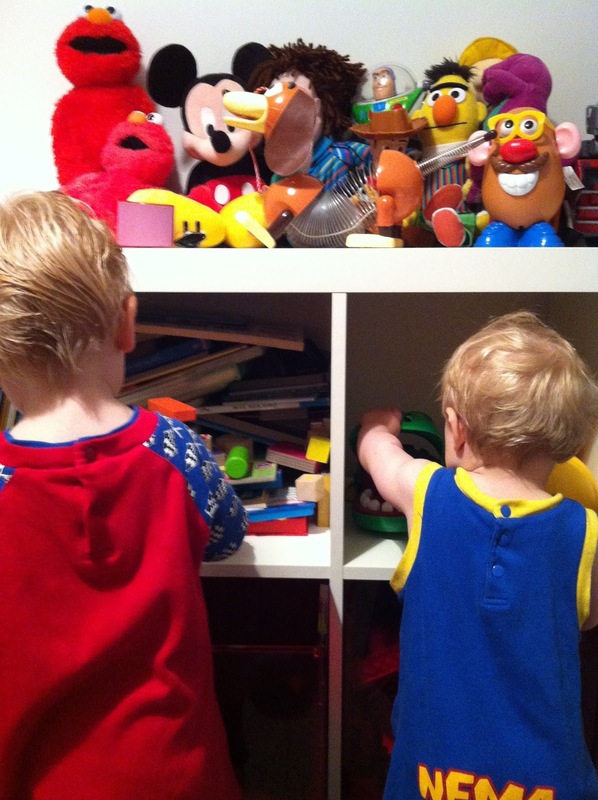 Regular decluttering will help keep multiplying toys in order. At this time of year encourage grandparents and family members to give them gifts they really need, or give them the gift of time (which certainly won't fill up your home!). Time spent with a grandparent or extended family member will be a wonderful memory that they will always cherish. How many of us can remember specific gifts we got from our relations, but a trip to the pantomime or zoo will be a memory that lasts forever. And finally, before December 25th remind everyone of the four gift rule! Wishing you all a happy, healthy and clutter free Christmas!